My uncle said this to me many years ago and I wondered for many years does it have any significance. Its a bit like the saying “never back odds on and never run up steps”. 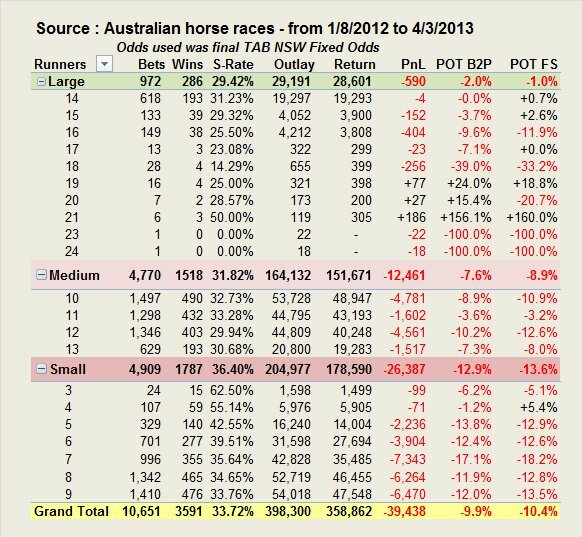 Well there is a very powerful piece of software out there which allows you to do this sort of analysis, TAB Probet (www.tabprobet.com.au) so I thought I would put the theory to the test using over 10,000 races and share the results with you. I recorded the number of runners in each race and split the results into Small, Medium and Large race size. So even though the strike rate went from 36% in small fields to 29% in large fields, the POT (Profit On Turnover) improved from 13% to a very creditable -1.0%. Remember the final fixed odds have a margin of around 16 % so reducing this to 1% (Flat Stake) and 2% (Bet To Prices) is a very good outcome. And it doesn’t take much thought to turn around a disadvantage of less than 2% and make a consistent long term profit. As Arthur would say “this is a nice little earner” and without any hard work , which he hated anyway. Does anybody want to share any similar analysis ? By anomalynick in Uncategorized on March 6, 2013 .